Black House Coordinator Teonna Anderson leads a toast with soft drinks during the reopening of CSUN's Black House on Nov. 2, 2017. Photo by Sarah Dutton. 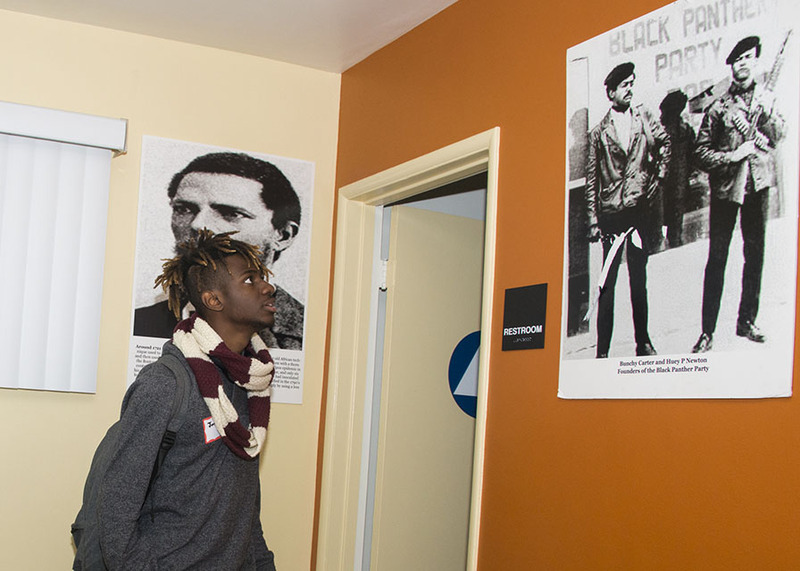 A CSUN student admires the art displayed in the Black House. Photo by David J. Hawkins. 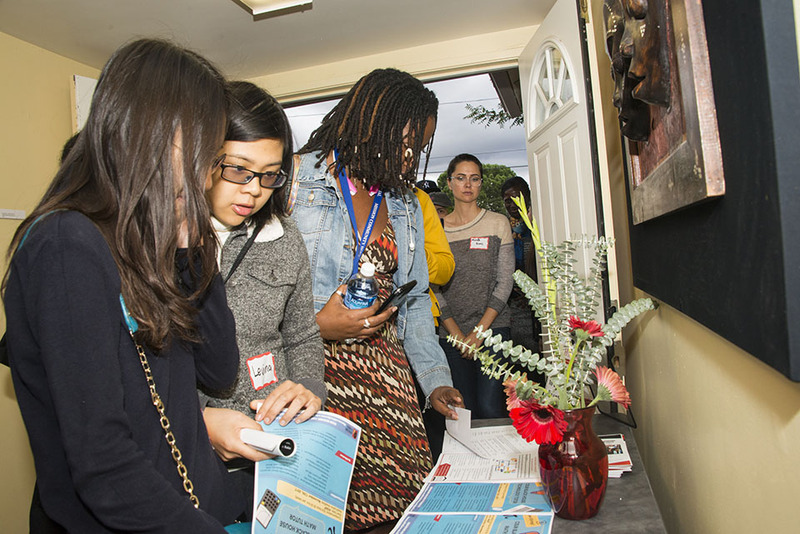 CSUN graduate student Mark Emeka (left) and others check in at the Black House reopening, Nov. 2, 2017. Photo by David J. Hawkins. 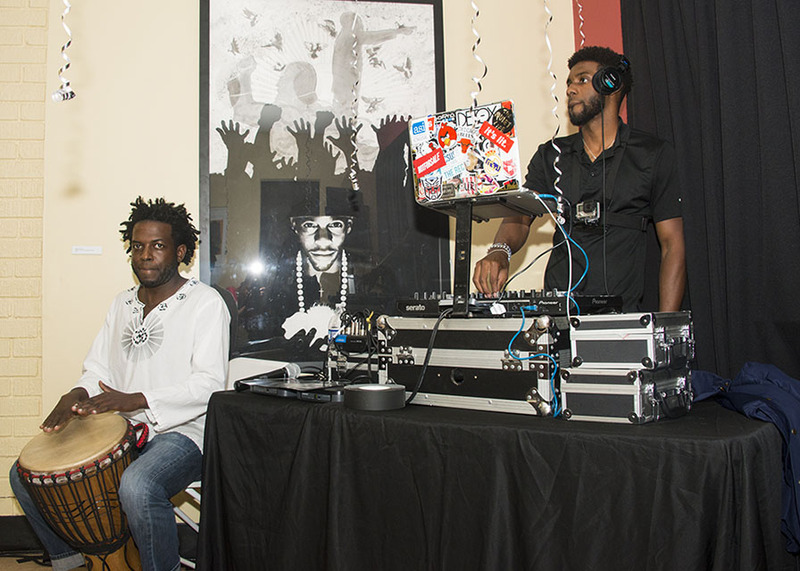 The CSUN Black House reopening celebration features a DJ and live drumming by Curtis Byrd. Photo by David J. Hawkins. Former CSUN student and poet Kendon Tillis performs some of his poetry during the reopening of the Black House, Nov. 2, 2017. Photo by David J. Hawkins. Students participate in self-guided tours throughout the newly remodeled Black House, Nov. 2, 2017. Photo by David J. Hawkins. 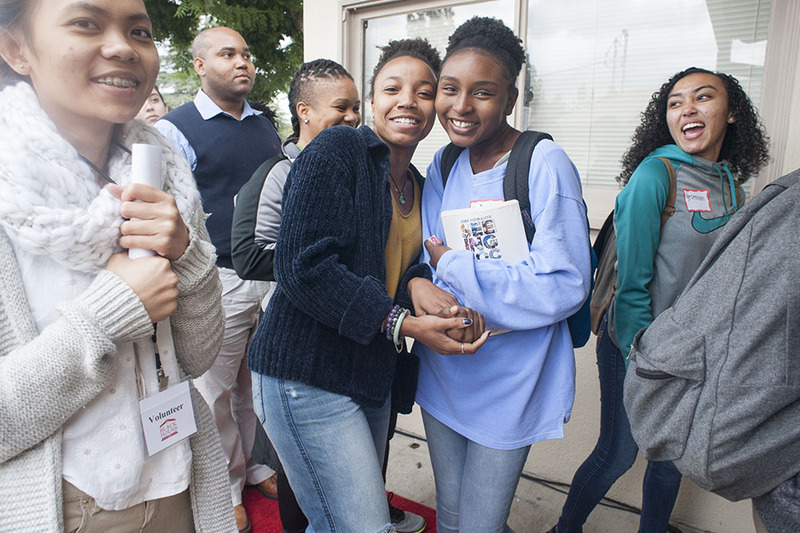 Students wait to enter the packed CSUN Black House, during the celebration of the facility's remodel, Nov. 2, 2017. Photo by David J. Hawkins. CSUN students, faculty and members of the community await the reopening of the Black House, Nov. 2, 2017. 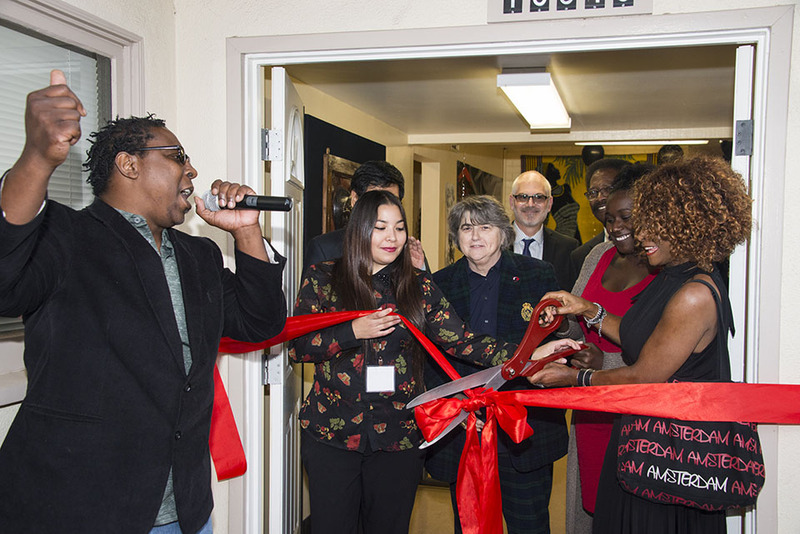 The Department of Africana Studies and Black House Coordinators cutt the ribbon at the door of the remodeled Black House, Nov. 2, 2017. Photo by David J. Hawkins. 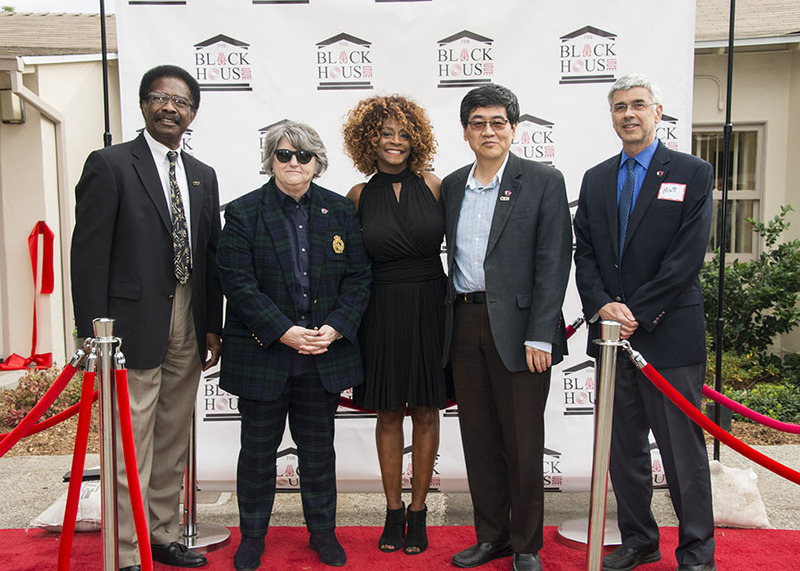 CSUN students celebrate the reopening of the Black House on Nov. 2, 2017. Photo by Sarah Dutton. 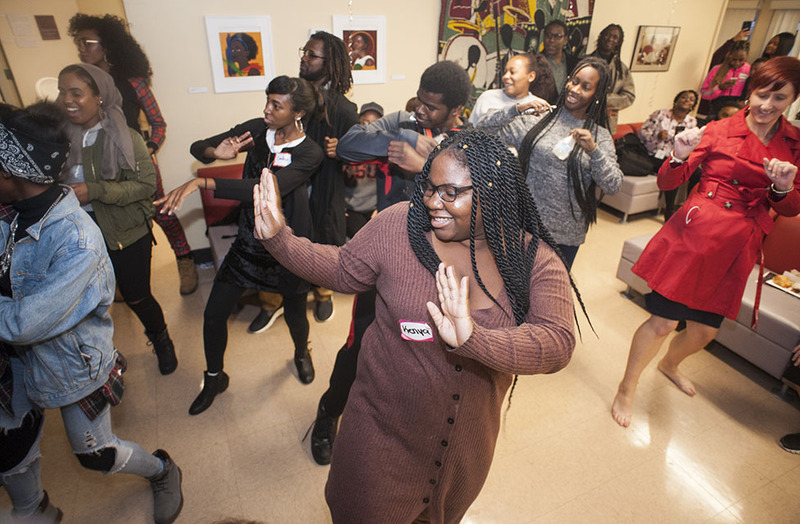 CSUN students and faculty dance during the reopening of the Black House on Nov. 2, 2017. Photo by Sarah Dutton. 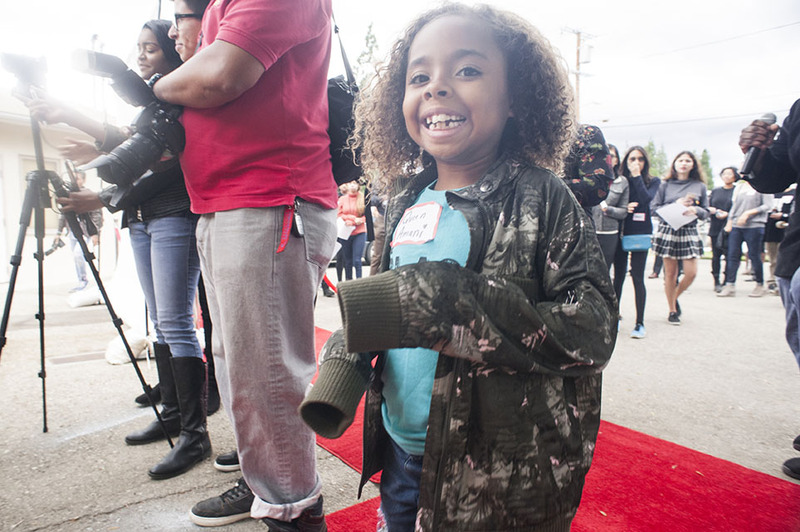 California State University, Northridge students, faculty and community members gathered Nov. 2 to celebrate the reopening of the CSUN Black House, located on Halstead Street in Northridge. Theresa White, Department of Africana Studies chair; Yi Li, provost and vice president for academic affairs, William Watkins, vice president for student affairs and dean of students, and the Black House coordinators led the ribbon-cutting ceremony with remarks, a toast and a red carpet welcome to officially reopen the home, as visitors anxiously waited. 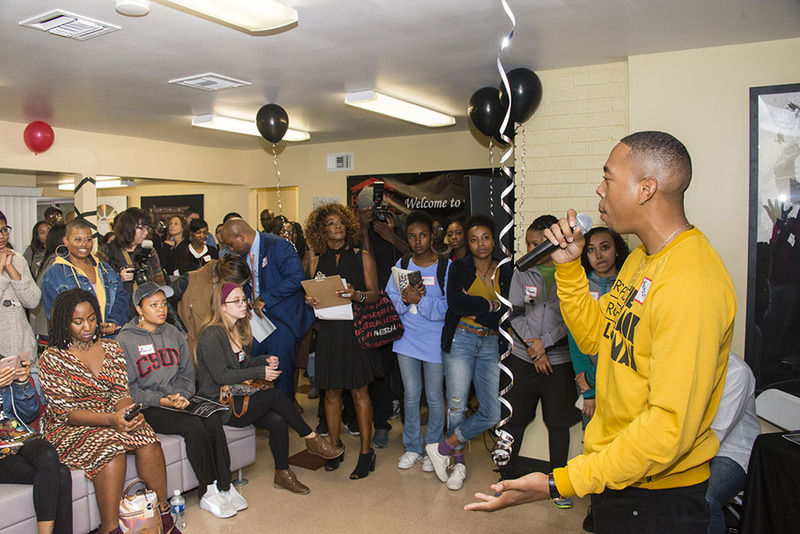 The renovated Black House serves as the headquarters for the university’s Black Student Union (BSU), as well as other CSUN black organizations. The newly renovated 3,000-square-foot facility was originally granted to the students of the BSU, along with the Department of Pan African Studies (now Africana Studies) in 1992. 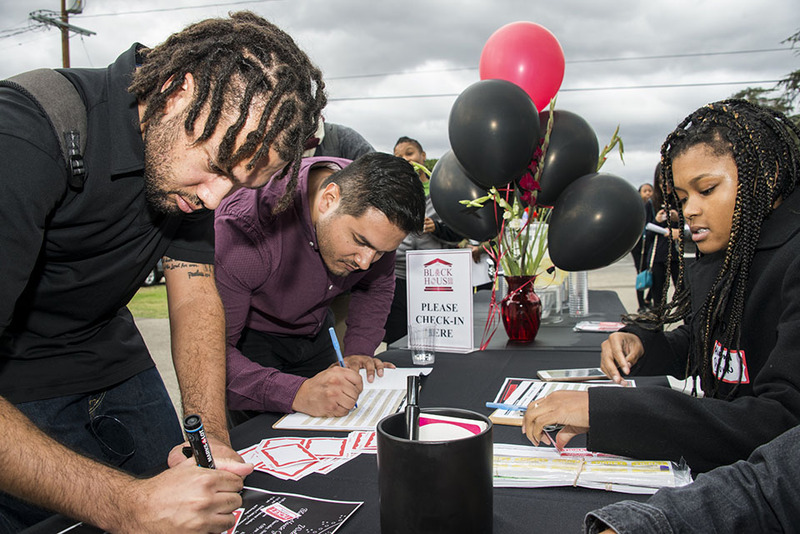 The first CSUN Black House opened in the 1970s as a response to the growing population of black students attending the university, who yearned for a place of community that reflected their culture. Once inside the remodeled building, students and guests explored the new space and took self-guided tours of the facility. Africana Studies professor David Horne briefly shared the historical evolution and legacy of the Black House, which previously served as a CSUN police station and a shelter to black students after the Northridge earthquake in 1994. The new Black House features two conference rooms, a film screening room, a fully equipped computer lab, in-house library, backyard garden, tutors and more. The art on display in the Black House, curated by Department of Art graduate students Michelle Nunes and Killan King, is a collection of donated Afrocentric pieces, accompanied by artwork made by CSUN students from various departments, particularly the Art Department. The facility is the result of collaboration and effort from current Matadors and students from past generations. During the celebration, former CSUN student and poet Kendon Tillis entertained a packed house of guests with original poetry, accompanied by drumming by Curtis Byrd. 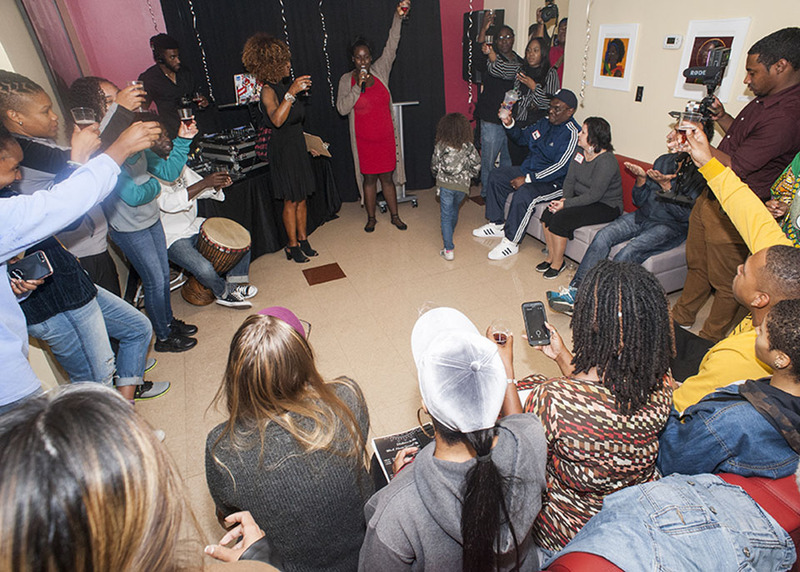 Following the performance, CSUN students and faculty members danced in the main room to a live DJ, while enjoying free food and refreshments. White inherited the Black House when she took on the role of department chair in 2016. Prior to that, the home was closed for a year and a half due to poor maintenance and conditions. 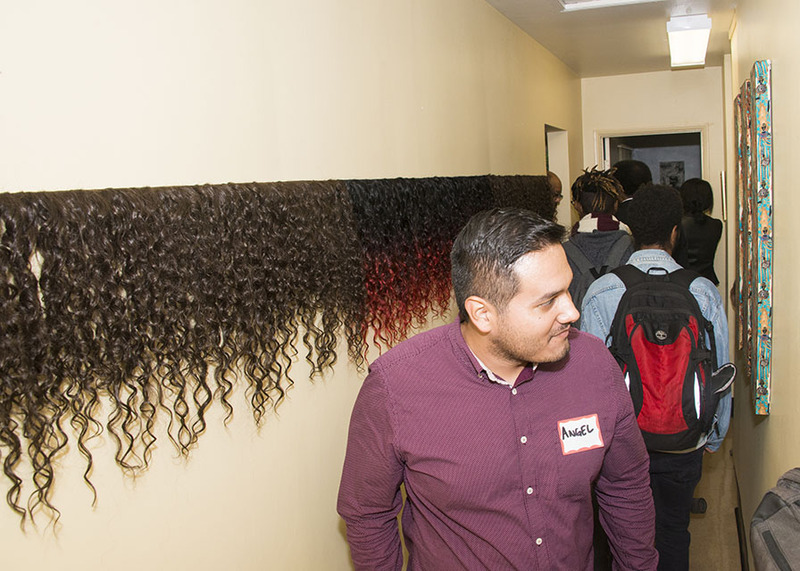 In May 2017, the organization hosted a “soft opening” event to introduce the home to more students. With support from the provost, vice provost, vice president for student affairs and the Africana Studies Department, the facility was able to reopen in time for the fall 2017 semester. In fall 2016, White applied for a grant to fund the housing renovations and furniture needed. She hired two new Black House coordinators, Teonna Anderson and Nicole Loy, to assist with the strategic planning and organizing of the event as well as the renovations, which were revealed Nov. 2. “I am excited for students to come use the Black House and have a space where they feel comfortable,” said Anderson, a business management major. The new Black House logo, created and donated by Joyclyn Dunham, projects and programs coordinator at the Delmar T. Oviatt Library, was revealed at the reopening. The facility is open to all CSUN students and campus-based organizations. Students are encouraged to use the space for meetings, cultural events and other academic programs.